Seikogi and Dub Rubb like this. In fact I was so impressed I went over & bought one !! Good grief !! Its a long read and explains in detail why they went for the acrylic, 2 piece caseback and the "wobbly" crown. DavidUK, EPK and serge70 like this. Slm643 and serge70 like this. EPK, serge70, Seikogi and 2 others like this. Very good looking, especially the black bezel! Works better than a silver one combined with a black insert. How is the strap? Is it flexible compared to other rubber straps? 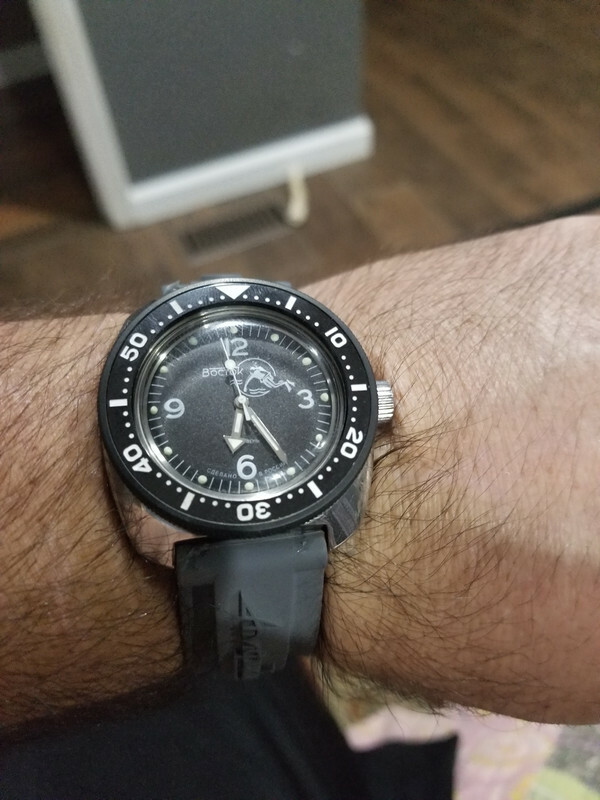 FYI Regarding the strap: Meranom uses some fat Vostok spring bars inside the rubber strap. After I replaced those with generic ones the rubber strap regained its 22mm width and the gap disappeared. EPK, serge70 and ohhenry1 like this. Thanks for the updates,can't wait for mine to land...Vostok rules ! !